This Tampa Bay Job Fair is FREE FOR ALL JOB SEEKERS! This event focuses on Tampa Bay, Brandon and Lakeland and surrounding areas. We are bringing TOP JOBS and the area's GREAT EMPLOYERS to the THOUSANDS of residents that live in the area to facilitate better employment opportunities! 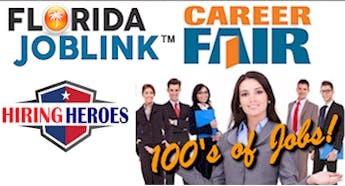 You are invited to attend our upcoming Tampa Bay career fair! This will be a great opportunity to meet local, regional, and Fortune 500 Companies with immediate job openings in EDUCATION, SALES, TECH, CUSTOMER SERVICE and more!. Our events are open to executive level experienced professionals as well as entry level and recent college graduates. This is your chance to meet directly with hiring managers! Make sure to REGISTER so that companies can review your resume prior to attending the career fair. Top positions will be filled ON THE SPOT in healthcare, foodservice, technical, sales, marketing, insurance, production, clerical, customer service, education, legal and more! Be prepared! Plan to take updated, crisp resumes to a career fair, prepare to interview on the spot. Professional Attire is Required. Are you an Employer? Are you in need of high quality candidates?